I finally decided Christmas was over and made a new layout lol. I've used Monica's Gorgeous "Sweethearts" kit. This kit like all Monica's wonderful kits are freebies, you can get it from her & Lorna's Blog HERE Don't forget to leave them both some love!! I'm Lisa, 25, from London, England. I'm not married & don't have any kids. 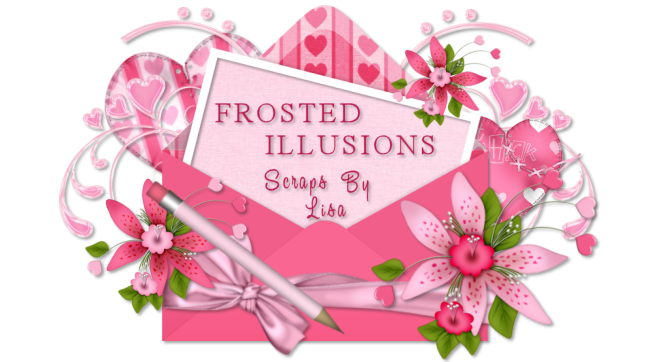 In my spare time, I mainly make psp tags & have my own tutorial site, "Frosted Illusions". I've resently started getting into Photoshop & i guess that was the need for this blog lol. Anyway enough waffle from me. Have a nosey round, there's a few freebies about. My Scraps are for personal use only. NO COMMERCIAL USE IS ALLOWED. These Images MAY NOT be reproduced for sale or redistributed in any way, including sharing with friends, offering for download on other sites etc. DO NOT use for any Obscene, Defamatory, Immoral works or any other use prohibited by law. Please do not change the filenames. Please do not claim these scraps as your own. Please do not alter any of them and claim them as your own. You may color and resize them to suit your projects needs. If you wish to use my scraps in your tutorials, you may do so. Please direct back to my Blog for purchase. If it is a Freebie, please redirect back to my blog for download. Are you a psp tutorial writer? Would you like to use any of my ptu scrap kits for free in your tutorials ? New PTU Kit "Hearts 'n' Roses"
New PTU KIt "Sweets For My Sweet"
New PTU KIt "Winter Wedding"